Most of us by now have smartphones and those of us that do, there’s a good chance you’ve heard of Pandora Radio. Pandora is a free application that allows you to type in your favorite band, song, genre of music. It will then create a radio station for you to listen to, starting with the original search term you used. After playing a song from that artist, it will play a song that it finds to be similar. This is a genius idea, which brings me to my next question. Have you found Joe or Black Country Communion through this application? 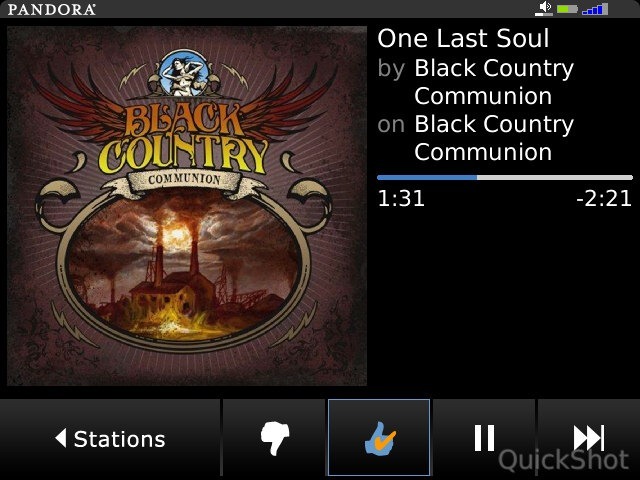 Pandora automatically selected Black Country Communion for me, based on what I had listened to previously. If you do not have Pandora on your smartphone (Blackberry, Android, or iPhone), I suggest that you get it! You can also stream online from their website.